RSS is an alternative view of a web page that allows you to subscribe and read the content in RSS newsreader software. Whenever the web page is updated your newsreader will automatically display the new item. RSS feeds are typically used with news sites or blogs, although any website can use them to disseminate information. When an update is sent out, it usually includes a headline and a small amount of text, either a summary or the lead-in to the larger story. You will need to click a link to read more. To subscribe to an RSS feed, right-click on a link below and select "Copy Shortcut" or "Copy Link Location" to copy the location URL and then paste it into the appropriate place in your RSS reader. Follow the instructions for your particular news reader. Where do I get an RSS reader from? There are many news readers available and many are free. Some news readers are programs you download and install on your computer and others are web-based services that you access with your web browser. There is a list of RSS readers maintained at DMOZ Open Directory Project. 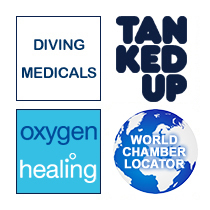 What RSS News Feeds are available from Midlands Diving Chamber?